MOSCOW, July 25. /TASS/. Russia’s sole aircraft carrier Admiral Kuznetsov will undergo 7-month trials after its repairs and upgrade, Zvyozdochka Shipyard CEO Sergei Marichev told TASS on Wednesday. "In mid-April this year, a contract was signed for the repairs and some modernization works that will last two years and a half, after which seven-month trials are scheduled," the chief executive said. ‘In the first place, large-scale repairs of the warship’s main propulsion unit are planned along with the replacement of boilers, the repair and recovery of main geared-turbine assemblies, powerplant compartments, the equipment of turbine and diesel-driven generator units and refrigerating mechanisms. This is a very large and technologically complex volume of work," he stressed. Zvyozdochka Shipyard specialists started repairs and upgrade works on the aircraft carrier even before the contract was signed, the chief executive said. The Shipyard has already drawn up a schedule of all the works and started working out technological documentation. The operations of dismantling, unloading and dispatching equipment to defense machine-building enterprises are proceeding ahead of schedule, Marichev noted. "Repair works under the contract have been launched in full since May within the framework of the documentation received," the chief executive said. The basic volume of works will be carried out at the dockside of Zvyozdochka’s branch - the 35th Ship Repair Enterprise in Murmansk in north-west Russia, he added. "At a certain moment, the ship will be delivered to the dock for dismantling the line of shafts and screws, carry out their flaw detection and repairs, repair the sea valves and make coating of the hull’s underwater part. This operation is planned in Roslyakovo, in the PD-50 floating dock," Marichev said. The shipbuilders signed a contract with Russia’s Defense Ministry in April this year on the repair of the Project 11435 heavy aircraft-carrying cruiser Admiral Kuznetsov. 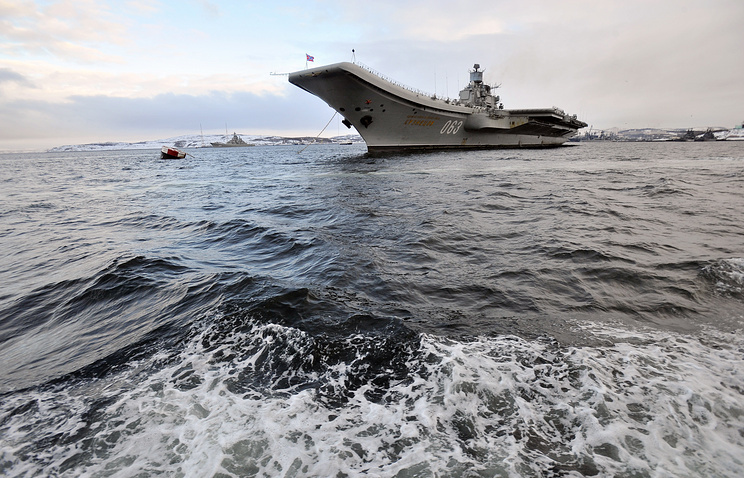 As Russian Navy Deputy Commander-in-Chief Viktor Bursuk said earlier, repairs on Russia’s sole aircraft carrier started in May this year and the Navy expects to get the upgraded warship back in 2021. During its upgrade, the aircraft carrier is set to get new air defense systems, in particular, the Pantsyr-M surface-to-air missile complex. Also, the aircraft carrier will be furnished with new powerplant, new boilers, pumps and flight control systems. The Project 11435 heavy aircraft-carrying cruiser Admiral Kuznetsov is designed to gain superiority at sea and in the air in the areas of the fleet’s operation to ensure the fleet’s combat sustainability, deliver air strikes against enemy targets and support troops’ landing operations.